LocalDines.com, was established in 2009. We are the most advanced and comprehensive online dining guide in Arizona. We are in no way affiliated with any other online dining guides, TV shows or radio programs. 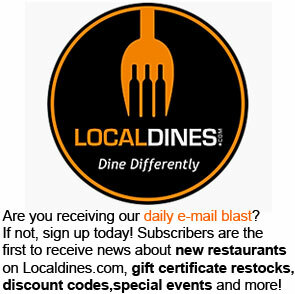 By offering dining gift certificates at 50% of the face value, customers of LocalDines.com have the incentive to try new restaurants that they might have previously overlooked, or had never known about. As a small business, your support means the world to us. Let us know if you have suggestions for our website, or recommendations for new restaurants that you'd like to see on LocalDines.com. Please feel free to contact us with any concerns or questions about our website or services. We look forward to hearing from you and we respond to all correspondence. Customer Service Toll-Free: 1-866-379-3463 (DINE) or info@localdines.com. Discovered a restaurant is out of business? Let us know: closures@localdines.com. Do you own a restaurant? Click here for more information.